My solo comics title, originally published by Alternative Comics, and now self-published under the Hang Dai Editions label. Hang Dai Editions, 2018. 24 pp., $5. Full-color throughout. 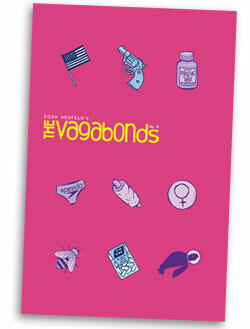 A lot has changed in this country — and the world — since the last issue of The Vagabonds, so it’s only fitting that this issue features a Donald Trump story. An explainer on the former British spy Christopher Steel’s “dossier” remains surprisingly relevant, as special counsel Robert Mueller seems to be using the memos as a “road map” for his investigation into collusion between the Trump campaign and Russia. 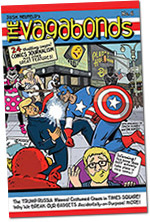 This issue’s longest story looks into the influx of costumed characters into New York’s Times Square. The piece explores the phenomenon of all these unlicensed Elmos, Spider-Men, and Minnie Mice, and why are they there. Do you often find yourself losing or breaking your old phone just when a new model reaches stores? Well, you’re not alone… “Why We Break Our Stuff Accidentally-on-Purpose” shows how researchers were able to get test subjects to replicate this risky, self-destructive behavior. The issue closes out with a couple of shorter pieces, including a collaboration with acclaimed artist Martha Rosler. Hang Dai Editions, 2016. 24 pp., $5. Full-color throughout. 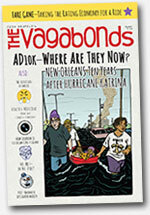 In this issue, we catch up with four of the main characters from A.D.: New Orleans After the Deluge. Another longer piece from this issue is “Fare Game” (with Michael Keller) — a follow-up to Terms of Service — which takes a look at ride-sharing services like Uber and Lyft, and the implications of a society where we’re all rating each other based on everyday transactions. This issue features two collaborations with writer Adam Bessie, who is bravely living with a cancer diagnosis. Other pieces in this issue include a rundown of the origins and meanings of emojis, a humorous take on steroids in Major League Baseball, the changing nature of Brooklyn, and a selection of one-page comics. Hang Dai Editions, 2015. 24 pp., $5. Full-color throughout. 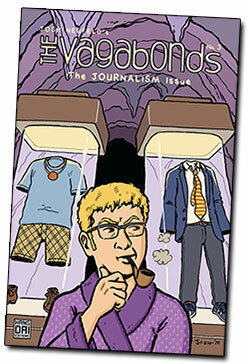 This issue serves up a spicy blend of journalism, social commentary, memoir, and literary fiction. The lead piece is a new work of comics reportage called “Crossing the Line,” about profiling at the U.S./Canadian border. Also includes three collaborations with Neufeld’s wife, writer Sari Wilson (author of the debut novel Girl Through Glass). Throw in a couple of light-hearted travel tips, and The Vagabonds #4 is chock-full of goodies. Hang Dai Editions, 2014. 24 pp., $5. Full-color throughout. 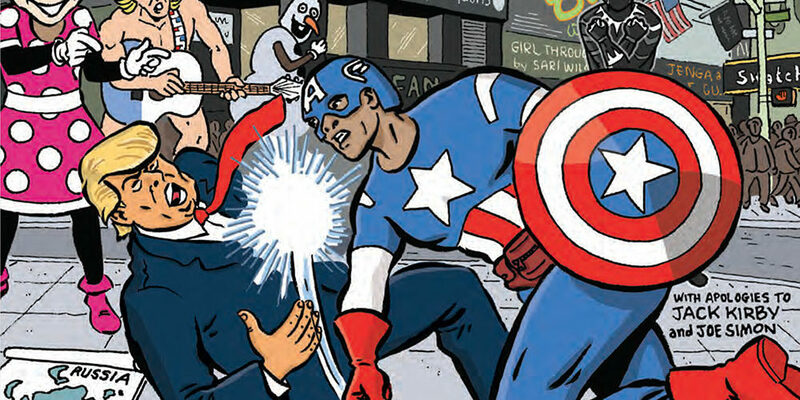 Alternative Comics, 2006. 32 pp., $3.50. Dark brown ink on cream paper with full-color covers. Collaboration has always been part of my comics repertoire. 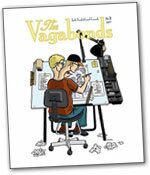 In The Vagabonds #2, that tradition continues — with some strange twists and turns. Contributors include Harvey Pekar, David Greenberger, R. Walker, artist Martha Rosler, award-winning poet/memoirist Nick Flynn, literary cult figure Eileen Myles, and the New York downtown theater company The Civilians — as well such offbeat collaborators as The Beatles’ “Eleanor Rigby,” a 1980 issue of Superman, and Neufeld’s own mirror reflection. Alternative Comics, 2003. 24 pp., $3. Green ink on cream paper with full-color covers. Uses gentle humor and a keen eye for revelatory detail to explore religion, global politics and the mysteries of everyday life, in locales as diverse as the Thai countryside, San Francisco and New York City. Stranded in a remote corner of Thailand, Josh and Sari are taken in by a family of Baptist missionaries. New perspectives — the missionary view of Thai life and the Buddhist view of fireboats — force them to confront their own spiritual longings.